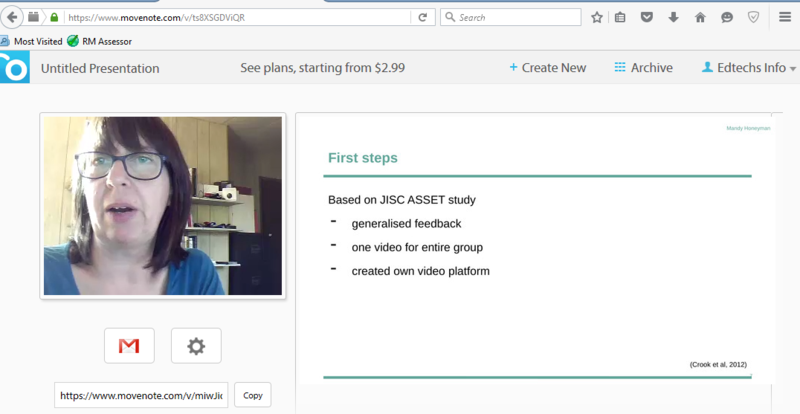 I have been having a closer look at Canvas and today I found video feedback. 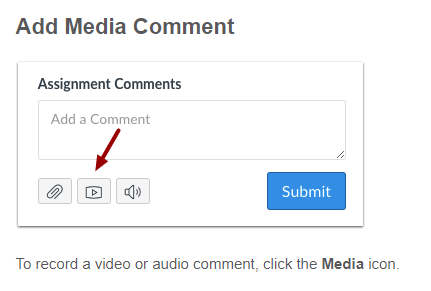 It’s an unassuming little button available on the SpeedGrader (you can see it in action in this webinar Google Apps + Canvas = BFF) and more information is available in the Canvas documentation for SpeedGrader. If you like the idea of speech recognition then Canvas SpeedGrader also includes options for using Chrome speech recognition when also using the Chrome browser. Why am I so excited by these? If you look back over some of my earlier posts and writings you’ll know that I think a video is the most powerful way to communicate with students so that they get the best out of assignment feedback. 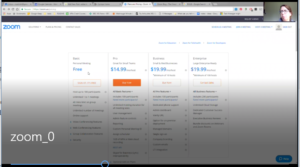 Posted on August 8, 2018 August 8, 2018 Categories assessment, e-learning, professional, teaching, videoLeave a comment on Investigating Canvas and found video feedback! If you haven’t been invited to a Zoom meeting yet, where have you been? No? But seriously Zoom is everywhere – maybe because it has won a slew of awards. Zoom started in 2011. First off, there is a free version. Thank goodness, because the “education” pricing is aimed squarely at institutions rather than individual teachers. One of the main things missing from the free version, that would be lovely to have access to, is the ability to use breakout rooms – though this is possible on a 30-day free trial and maybe through a specific additional subscription. It is very easy to use, even if you do have to download the app for your desktop (or other devices). I like that you can share the screen and that the video of the speaker/sharer thumbnails to the top right, which maintains the connection – one hopes – between the speaker and viewer. The app also includes an option to share a white screen and, again – untested, probably all users will be able to write on that. You can record and the recording (mp4) is saved on your own drive – this maintains privacy if you are wanting to use video for assessment, you could email the video, share it via google drive or any other cloud sharing environment you are using. A really interesting feature is that an audio file (m4u) is separated out – which creates a much smaller file making email even easier to send. Not sure why this is useful, but it might be. First things first, no recordings using this app. You could use some other app to record, but that’s missing the point. Cyclops are the new kids on the block, I think they only launched in 2017. This application is about enabling teams (how about online classes?) to feel as though they are in the same room. It streams your camera and audio peer to peer, which means that the video isn’t stored (and it is encrypted). 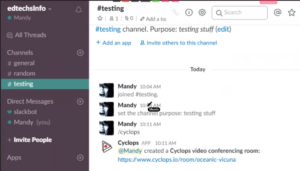 I love that it can be easily launched from inside Slack. Another excellent feature is the ability to enhance a whiteboard so that scribbles become more legible. Anyone in the room can annotate the board collaboratively too. This would also work on any shared screen – though it is a little cumbersome so needs some practice to become fluent. A potentially great feature is the transcription which can then be emailed to users. It isn’t perfect, it works best if using headphones even though there is a choice to record the room; it makes lots of mistakes and to avoid those one has to speak unnaturally clearly. However, I think that this beta option can only improve but it potentially also makes the application stand out in a crowded field. I had a little fun with it too – inviting myself to a meeting (I used an incognito window). www.soundtrap.com seems to be a particularly effective sound editor, a big step up in terms of ease of use from Audacity. Has a 5 project basic free account. Open Broadcast Software is a video editing application. I have just started using this, will report back again when I’ve used it some more. But it is a light touch option, gives a preview, not a big download and looks like it has everything one would need to produce edited video. Someone else suggested using EDpuzzle to track student’s understanding of what they are viewing in any video assigned to them. I can’t wait to use this application, and don’t worry you can add any school name to sign up if – like me – you are using this as an online tutor or are just researching. To go with this application, I suggest exploring the badly named MoocNote where students can take notes while watching any video. I am looking forward to my next edCamp! Thanks go to the wonderful organizers in Portland and everyone who pitched a session this time through. Personal learning environment – my space? Personal learning environments (PLEs) are simply a collection of applications, websites and technologies that we use for studying. Because I also learn from people, I have included my personal learning network (PLN) incorporated with my PLE. It also changes all the time and this one was created a couple of years ago. 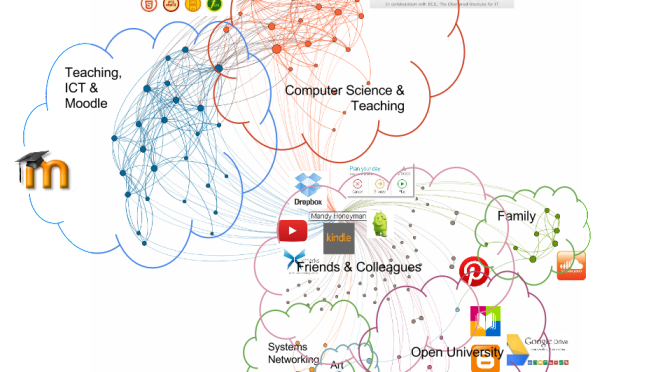 I would make Twitter a much bigger part of it today if I were to redraw it and I would include Moodle too. My PLE also includes things which I am not representing on this image, because they don’t have icons. For example I am typing on a Chromebook and this little notepad computer has become the place where I study most of the time. I don’t write assessments and I can’t use Mendeley on it, but for reading, making notes and searching it is great and very portable. But the most important thing for me is that I am not at my desk, if I were at my desk I would be worrying about work rather than working on my studies. So I do think that PLEs need to also include a sense of the physical environment as well as the technological one. When I first did this exercise I looked at a lot of other people’s PLEs and saved their images to Pinterest. Pinterest then became more interesting as a space for keeping diagrams, images of other research topics – as well as a shopping wishlist! Follow Mandy's board PLE on Pinterest. So where are PLE headed? The very nature of PLE are that they are fluid, the applications and technologies will change as our needs change. So at the moment I am using Twitter much more than I have done in the past. Partly this is because it is encouraged by the course I am taking (MA ODE) and many of the students are using the #H800 hashtag to support each other and share experiences. It does make me wonder though whether the use of Twitter is therefore not really part of my PLE at all for this module but has actually been usurped by the module team? However, because I still follow many other people who are constantly introducing me to interesting resources and material, I think I can be relaxed about this. I have also moved from eBlogger to hosting this blog in my own WordPress environment. As I learn from reflecting and I am using my blog for reflecting it therefore also needs to be included in my PLE. I purposefully chose to keep my blog away from the OU’s hosting service for it (still part of Moodle), because I wanted to use my blog more openly and, in the end, of course am intending to attract an audience. 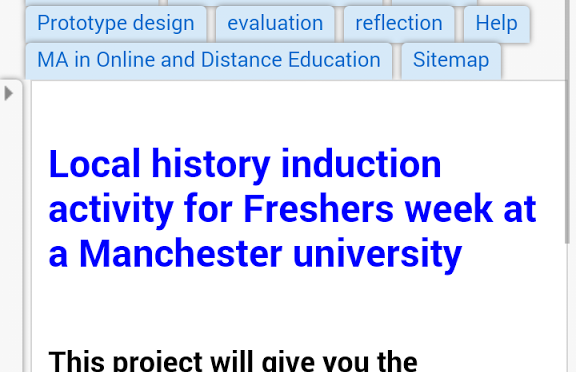 I don’t think that happens via the university’s hosted blog service. I certainly hardly ever read any blogs that are there, but at the same time recognise that for students who don’t want to have to start their own account anywhere else, it is more convenient to satisfy course requirements by taking the simplest route. Students should be free to make choices and work together. Whether these choices are free of influence is a different matter and probably one that will become more interesting to look at in the future. At the moment I think we are in a time of settling in. We are getting more used to incorporating different technologies into our learning as students and our teaching as teachers. It is only when those technologies are embedded that we will be able to really see the effect they have had. There is a tension between innovation and experimentation and being able to give students a good learning experience. I learnt this the hard way when I used a beta version of AppInventor with some students on a GCSE project; unfortunately the hosting of this application was changed halfway through their project and this caused a few problems. I had assumed that something hosted by Google would be more stable – now I know better. Considering the stability of any technology being incorporated into an assessment has to be a priority. Although everything turned out okay in the end, it was unnecessarily stressful at the time. When I was teaching my approach was always to stay ahead of the curve with technologies and I think that my students appreciated that they were getting to try out new things and it often made the tasks they needed to do fresh and exciting. But sometimes, as is the way with all technologies, there were delays and frustrations too. This shouldn’t, however, ever stop us from assessing new technologies in order to find fresh ways to approach learning and teaching. 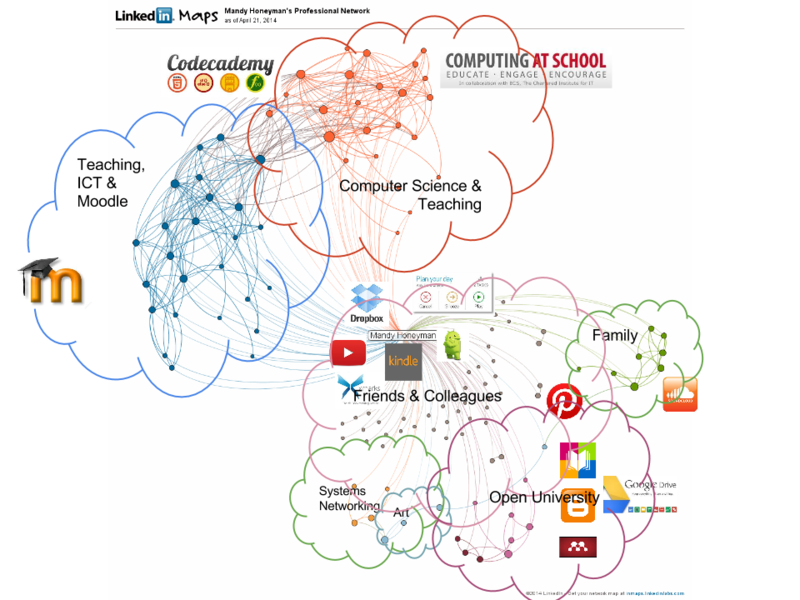 Posted on July 2, 2015 March 29, 2016 Categories e-learning, edtech, evaluation, MAODE, PLE, reflectionTags PLE, PLN2 Comments on Personal learning environment – my space? 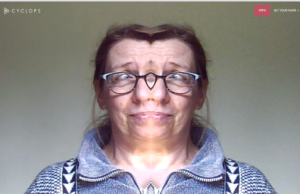 I am in the process of writing a paper about Screencasting Software (SCS) and at the same time I am playing about with different software, probably as a procrastination method, but also because I want to see what is on offer. This was made using the free version of Collaaj which allows a 2 minute recording to be uploaded. This video took up about 12 MB so theoretically one could store around a hundred 2 minute videos (actually less, but lets not quibble). It would also be good to play around with the kind of mouse used. This would need to be done in windows (or whatever OS) settings. It is possible to download and install custom mouse pointers (see deviantart.com, search for mouse cursors, go to personalise etc etc). These screenshots represent the first page of our prototype website viewed on my mobile phone. 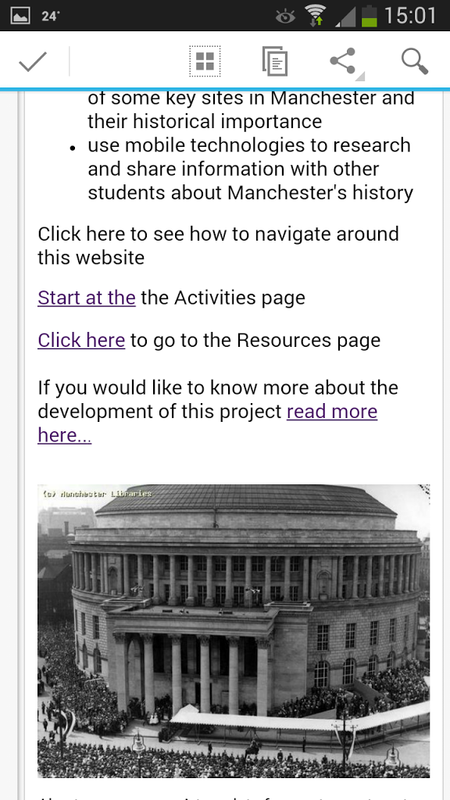 The objective was to work in a group to produce a resource enabling people to learn about local history (of some location) using mobiles and social networking. I think, rather remarkably, we succeeded in doing exactly this and we haven’t even yet fallen out. Having read ahead through the materials I knew this task was coming up and it wouldn’t be exaggerating to say that I was absolutely dreading it. My earlier experience, during Block 1 of H808, of feeling responsible for sending the group off down completely the wrong track was not yet a distant memory and I was quite determined not to do that again! But I also made the decision not to allow that to stop me from just getting on and doing my best to ensure that we all succeeded. I was quite happy when I was assigned to the local history project, because it was similar to a project that I had started to work on several years ago and I felt that that work might be useful to this. In the end it really wasn’t helpful except as a talking point and a reference for myself when it came to creating a template for teachers to use to set up their own activity. However it also quickly became apparent that almost everyone else wanted to be doing something else which created a slight air of negativity that needed dissipating. It was interesting that quite a few people saw little to no purpose for their own learning to be doing this project, needing it instead to be something tangible that they would be able to use in their own environments in order for it to have meaning. This is something that we struggled with throughout the project. I additionally chose this project because it played to my strengths; I understand mobile technology, I understand web development and I understand how to mash everything together using social networking. My personal challenge was to step back and allow others to demonstrate their own strengths, for example with organising the site or getting to grips with appropriate theory and working through the module required design challenge it. My contribution to working through the module requirements was to create a Gantt chart for us and continue to encourage everyone to use it. I think most people did end up using it and venture that when people didn’t was when they became unsure about what they should be doing. I also decided to toughen up a bit and if other people were struggling with aspects of the project to resist imagining it was my responsibility to untangle them. That was also the reason I didn’t want the team leader role even though I took on several aspects of it and shared other aspects particularly with Lawrence. It was interesting to see people shine though and everyone did at one point or another. Our meetings were generally amiable and only occasionally did anyone (including me) succeed in taking us off track. My weakness in meetings was that I had such a clear idea of how the project was going to pan out, not specifically our vision, but the practical side of it, that I was continuously pushing towards that outcome and sometimes not taking into account or enough heed of a suggestion that might take us too far off that track. But at the same time, there was often an unhappy equilibrium between just getting on and doing things, without asking others for permission, and trying to seek consensus. Following the process outlined by the module had its issues but overall it provided a means to an end. It was interesting, if sometimes a little frustrating, to see a learning design theory in practice. Once we allowed ourselves the liberty of assigning different tasks to different people (at the point when we split up the theoretical and case study research), the whole project became a lot smoother. Before that there was a constant concern that one or two people might not be getting something done and might be holding up the group. I would be sad if now I were to read that some people were unhappy with their own contribution or unhappy with anyone else because I sincerely believe that everyone in the group contributed critical aspects to the overall process and the product, because whether or not they achieved their personal goal, as a group, we achieved our collective one. Firstly, my understanding of rhizomatic learning is that it is based on the idea that learning creates itself, it is similar to a tree root structure that has no imposed structure, but where the roots grow where they can and where they will be strongest. I am not convinced largely because I believe that this is an approach that already exists, this is simply a label to describe something that does not have a central proponent. For example how people build open source software, they have skills that they bring to the project, which may have originally been thought up by an individual or a small group, but they will frequently have to learn more in order to be able to produce something that works. I would be unlikely to use this approach but it would, maybe obviously, depends on the circumstances. It is an approach that might lend itself more obviously to some things (like creative projects) rather than a specific subject with outcomes. What happens to “outcomes” and “objectives”? Assessment would have to be very different and having looked, briefly, at Dave Cormier’s class (http://ed366.com/) it seems that this approach may be suited to those who want to experiment with the ideas of learning itself. I don’t know, I was put off by not being able to find a description or structure, I was unable to understand why I would invest any time in this. One of the issues that might arise from this approach might be our natural need to be right or wrong, to be praised, to feel successful. The success needs to come from the learning itself and that might not be enough.